When 23-year-old Elvis Presley was inducted into the United States Army on the morning of March 24, 1958 – or “Black Monday” if you were one of his mourning fans – he was the undisputed King of Rock and Roll. As the day ended, he was just another lowly buck private. 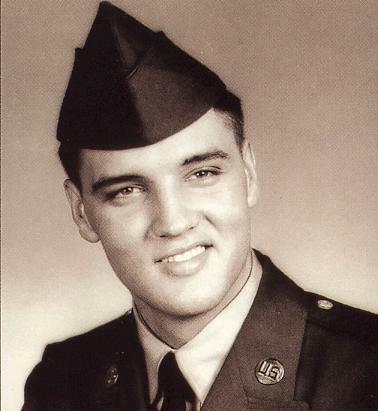 Before he enlisted, the Pentagon offered Elvis the opportunity to bypass serving as a regular soldier by joining the special services, which meant when Elvis completed six weeks of basic training he could return to his normal civilian schedule. The only catch was that he’d be expected to perform a few times a year for the military to raise morale and encourage enlistment. This could have been a sweet deal for Elvis, but his manager, the infamous Colonel Tom Parker, was having none of it. Under those terms, Elvis would be performing free of charge. There was no way that Colonel Tom was allowing anyone to get his boy Elvis for free, not even Uncle Sam. Presley’s stint in the Army was a pivotal time in his life. There was the obvious adjustment of shifting gears from superstar to G.I, but Elvis also had to deal with the death of his beloved mother Gladys on August 14, 1958, while he was stationed in Fort Hood, Texas. An only child, Elvis had always been very close to his mother, and her loss was a crushing blow. The Army extended his leave by an extra five days but beyond that there was no special treatment, and Elvis had to head back to his life as a soldier. After training at Fort Hood, Elvis shipped off to Germany where he was assigned to the 3rd Armored Division. He was allowed to live off-base, so he rented a house in Bad Nauheim and brought over most of his family from the U.S to stay with him. Elvis was introduced to two “things” that forever changed his life while he was living in Germany – drugs and Priscilla Beaulieu. A sergeant had turned Elvis on to amphetamines to help him get through maneuvers, which he hated passionately. Presley found the drugs not only got him through those dreaded over-night maneuvers, they also helped him control his appetite and lose weight. Soon, he found he was depending on them more and more. As the years passed by, drugs turned out to be the King’s Achilles’ heel. Then one day a friend brought a beautiful 14-year-old Army brat named Priscilla Beaulieu to a party at Elvis’s house. He was instantly captivated, and those close to him say he remained in love with her the rest of his life. The two shortly thereafter began a courtship (with Priscilla’s parent’s reluctant permission) and later married in 1967, then divorced in 1973. Their only child, Lisa Marie, was born in 1968. I was in a funny position. Actually, that’s the only way it could be. People were expecting me to mess up, to goof up in one way or another. They thought I couldn’t take it and so forth, and I was determined to go to any limits to prove otherwise, not only to the people who were wondering, but to myself. Elvis Presley was officially discharged from active duty on March 5, 1960.